Ripple fell to a monthly low on Friday morning, breaching prices not seen since the start of February. 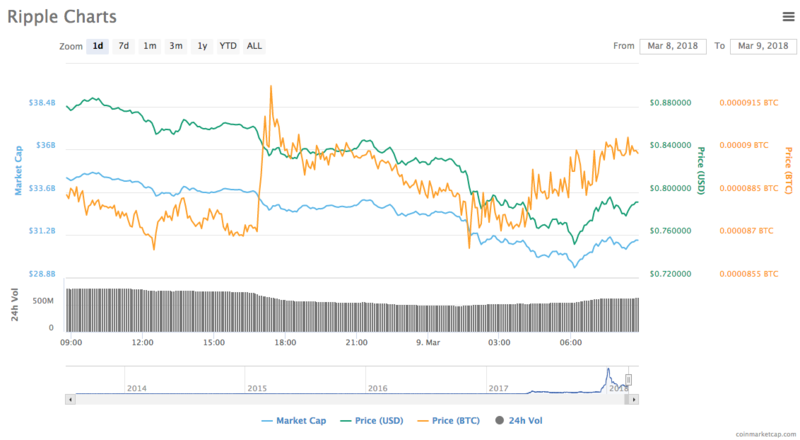 XRP opened on the markets today at $0.83, before dropping to $0.79 per token by 8.50am GMT, according to CoinDesk. As of 9.03am GMT, XRP is exchanging hands for $0.78 – down 22.7 percent on the start of the month. The bearish performance comes off the back of a wider crypto selloff, affecting major tokens across the board, including bitcoin, Ethereum and Litecoin. Here is the latest Ripple price, expert analysis and cryptocurrency news. All times GMT. Ripple Managing Director Danny Aranda revealed the cryptocurrency is plotting a worldwide cross-border takeover in a bid to stand out from its rival digital currencies and make worldwide payments easier for “real customers with real problems”. In an exclusive interview with Express.co.uk, Ripple’s Danny Aranda said the digital currency is planning a cross-border takeover to make global payment transfers quicker. Mr Aranda said Ripple wants to ensure it is producing “very viable” solutions that can be used in the digital landscape. He said: “I think a lot of what you see in the cryptocurrency space and in the blockchain space is really focussed on experiments or small proof of concepts. Ripple has hired a chief market strategist who use to work for Bloomberg Television. Cory Johnson will tell the payments start-up story to investors, previously he covered technology on TV and for Bloomberg Radio. “The role of Ripple as a company and XRP as a currency in financial markets, to regulators, financial institutions and investors could use more explaining,” Mr Johnson said. PacCoin has become the third cryptocurrency listed on CoinMarketCap. It has overtaken Ripple, which is now in fourth position. The price of PacCoin is listed as $0.013025 and it has a market cap of $33,461 billion compared to Ripple’s $32,017 billion. It is currently unclear what has led to the change in position, however the cryptocurrency has recently launched on Lescovex – a cryptocurrency exchange and trading platform. Lescovex said on Twitter on March 7: “PACCOIN is going to be listed on Lescovex! The price of Ripple currently stands at $0.81 – a 4.57 percent reduction – as the markets still recover from the announcement of the U.S. Securities and Exchange Commission that crypto exchanges must register with the agency. 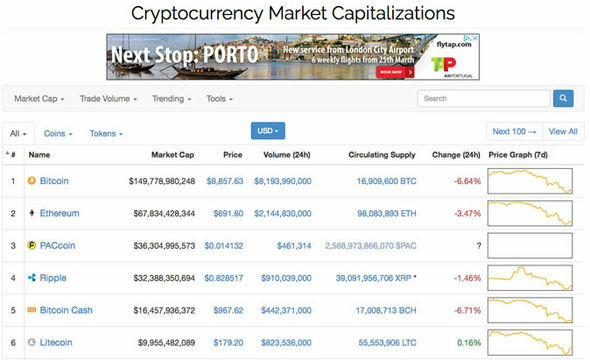 The market cap is $31,813 billion, according to CoinMarketCap.com. It fell to $0.78 this morning which is down more than 20 percent since the start of the month. 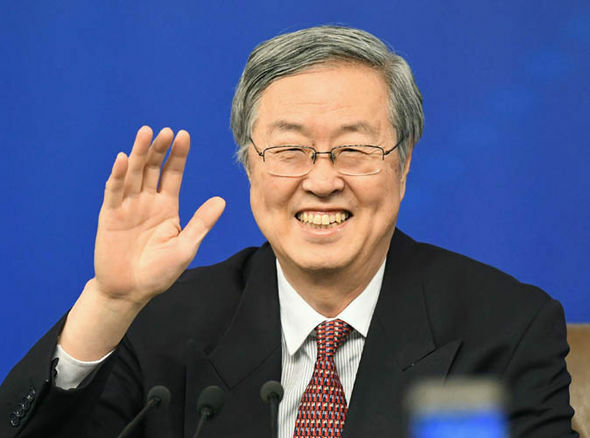 Zhou Xiaochuan, the central bank governor, underlined today his country does not recognise cryptocurrencies as a legitimate form of payment. He added: “If they spread too rapidly, it may have a big negative impact on consumers. Ripple Managing Director Danny Aranda told Express.co.uk even the smallest of movements can have an impact on cryptocurrency prices. He said: “It’s a relatively small market. There were $20 billion traded in and out of cryptocurrencies overall. “And if you compare that to the overall FX markets for say dollars and euros, that’s about $5 trillion a day. “So this, is in order of magnitude, smaller than our traditional markets that we have around in the present day. “And because it’s so timely traded, small movements can really affect the price. XRP was is in heavy decline against the US Dollar and bitcoin tis morning and could continue to fall, according to market analyst Aayush Jindal. Mr Jindal said: “At the moment, the price is trading near the 1.236 Fibonacci extension of the last wave from the $0.7869 low to $0.8778 high. It could continue to decline and it may even break the $0.7500 level. “The next major support on the downside is around $0.7300. The stated level also coincides with the 1.618 Fibonacci extension of the last wave from the $0.7869 low to $0.8778 high. Mr Johnson confirmed on Thursday he had left his television network to head the cryptocurrency company’s market strategy team. He said: “The role of Ripple as a company and XRP as a currency in financial markets, to regulators, financial institutions and investors could use more explaining. Crypto expert Roman Guelfi-Gibbs, the Director of Operations at Pinnacle Brilliance, is convinced one year from now Ripple will dominate the cryptocurrency sphere. He said: “Ripple certainly has the potential to move up a notch in 2018, but I think it will be more likely in 2019. “As the market observes more projects being coded in other algorithms such as XRP, ETH will likely take a backseat to the next big coin/token. 9am: Sebastian Kettley starts live reporting.